Big Band Library: April 2010 "Big Band News"
The Fox Lake Public Library in Fox Lake, WI has been awarded a Library Servies and Technology Act (LSTA) grant to digitize a portion of its collection of Bunny Berigan materials. Berigan was born in Hilbert, WI in 1908 and raised in Fox Lake. The grant was written by Rhonda Puntney, Youth Services and Special Needs Consultant for the Lakeshores Library System and also, importantly, a member of the Bunny Berigan Jazz Jubilee Committee. According to Julie Flemming, Volunteer Coordinator for the Library's Harriett O'Connell Historical Room, where the Berigan materials are held, "The grant will allow for 1,000 archival items, which includes loose pages, newspaper clippings, letters and 250 photographs to be digitalized for a combined total of $5,337 local and LSTA funds." It is expected that they will be viewable on the Internet by the end of this year, through the "State of Wisconsin Collection." On the 15th of next month, the annual Berigan Jazz Jubilee will be held in the American Legion clubhouse in downtown Fox Lake. Among the performers will be the so-called "Bunny Berigan Memorial Band." Berigan died in 1942 at the age of 33, and is buried in St. Mary’s Cemetery, two miles south of town on Breezy Point Road. This is national Jazz Appreciation Month, and a rare opportunity to hear from a former big band vocalist takes place on the 17th in Dallas, TX. Louise Tobin, 91, will appear at The Women's Museum to "recount personal stories about her associations with such history-makers of jazz as Harry James (her first husband), Ben Pollack, John Hammond, George Simon, Benny Goodman, Teddy Wilson, Lionel Hampton, Fletcher Henderson, Peanuts Hucko (her second husband), Louis Armstong, and so many others. Hers is a unique story of the challenges women musicians faced during the big band era." The facility is described as "the only comprehensive women’s history museum that chronicles the lives of American women through interactive exhibits." For more information, view thewomensmuseum.org. Count Basie Orchestra directed by Bill Hughes. Apr. 10, "Valparaiso Jazz Festival,"
Valparaiso University, Valparaiso, IN; Apr. 25, Blues Alley, Washington, DC. Vocal Groups," California Center for the Arts, Escondido, CA. Grande, CA; Apr. 18, Glendora, CA; Apr. 23, Pueblo, CO; Apr. 30, Cary, NC. Water Park, North Richland Hills, TX. Palace of Culture, Sofia, Bulgaria. Apr. 28, Watertown, SD; Apr. 30, Kearney, NE. Napa Valley Opera House, Napa, CA. PA; Apr. 29, Eichelberger Performing Arts Center, Hanover, PA.
Clinton, LA; Apr. 30, Chandelier Ballroom, Houston, TX. [ off and on ]; Goodman '51 / '52 / '53 / '54 / '55 / '58; Reynolds '55 "Songs for Happy Feet"
Mike Zwerin, 79, d.Apr. 2, 2010, "after a long illness." Trombonist with Thornhill '58. of books including biographies of Woody Herman and Artie Shaw. from them . . . And we're still playing swing the way Mr. Basie intended it." ]. Complete Atomic Basie" / "Chairman of the Board" / "Sinatra At the Sands" / "First Time! Herman "Woody Herman 1963" ]. [ OK ] Review - Courier / Newsgram, Apr. 6, 2010. Montgomery," Montgomery [ AL ] Advertiser, Apr. 5, 2010.
bandleader - arranger Fletcher Henderson ]. Apr. 21, 2010 [ review of Apr. 14th performance ]. 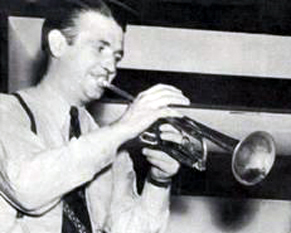 memorable band splits" of all time, including The Dorsey Brothers ]. on Dec. 15th, 1944" ]. Shaw; Thornell calls it "well-written, highly entertaining, and informative" ]. Roy Eldridge. "Urbane Jazz," Poll Winners Records 27230. [ 8-CD set incl. concerts from 1/43, 12/44, 1/46, 12/47 ]. [ 2 CDs; recorded live in Canada in Jul. 1967 with Ferguson's orchestra and sextet ]. already issued on CD in 2001 as Collectables COL-CD-6897 ]. [ formerly a VHS tape; produced in 1992 ]. with a trio, and with a big band ]. Yester Year ( UK ) DSOY814. 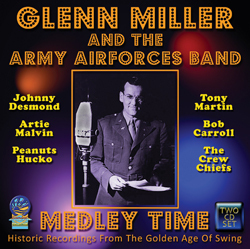 Glenn Miller Orchestra directed by Ray McKinley. 1931 to 1943," Universal 61826 [ 2-CD set ].